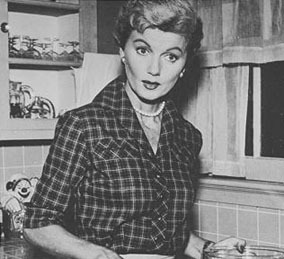 The actress Barbara Billingsley passed away on Saturday at the age of 94. Known best for her role as June Cleaver, the mother in the classic 1950s and 1960s sitcom Leave It to Beaver, Billingsley personified for millions the perfect postwar suburban mother. She never quite escaped from the role, going on to voice the nanny in Muppet Babies and play June Cleaver again in The New Leave It to Beaver, a sequel to the original sitcom that aired in the ‘80s. According to a family spokeswoman, Billingsley died of a rheumatoid disease at her home in Santa Monica, California. Billingsley married three times and is survived by two sons.